Camden in 1780 had become an important base of operations for the British. In late July a Continental army under Major General Horatio Gates marched from the North and was threatening the British supplies in Camden. 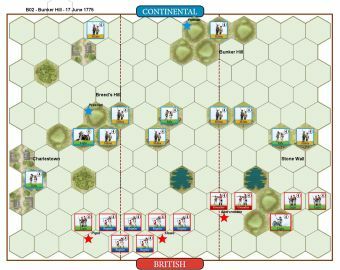 On 14th August, Cornwallis joined his troops determined to attack Gates. Cornwallis formed his army in two brigades; Colonel Webster on the right and Lord Rawdon on the left. The Highlanders provided a reserve. Gates drew up his army and ordered his left wing of militia to attack. These illtrained soldiers retreated off the field. 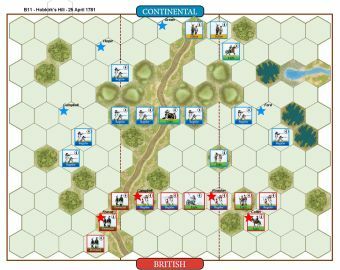 Webster’s regiments then moved to turn the Continental flank. 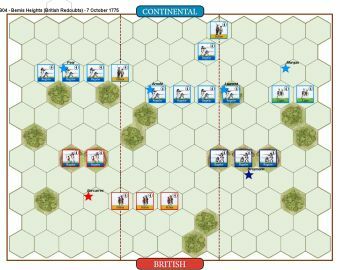 The remaining Continental soldiers fought bravely, but failed to resist the British assault. 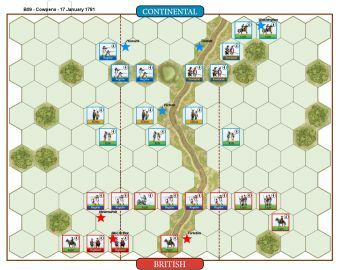 When Tarleton’s cavalry attacked the Continental right, the wing collapsed and the British cavalry pursued the retreating Continentals for some twenty miles. After the disastrous loss at Camden, Gates was removed from command and replaced by Nathanael Green. 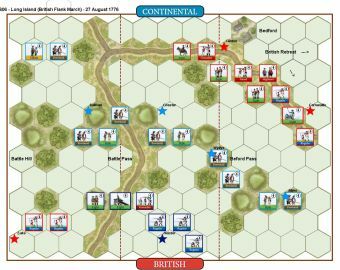 • The 2 Continental light infantry units have the abilities of light infantry, but have militia morale (retreat 3 hexes and are -1 die on rally checks). Game 2 and a tighter tussle with the British succeeding 8-3 but coming close. 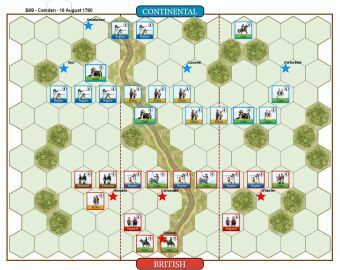 The British again cleared the American left of Light Infantry and Militia but just when victory looked academic, General Porterfield led the Armand Legion Light Dragoons forward with a Cavalry Charge with what was the only American unit left on that flank. 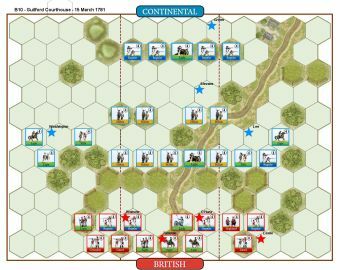 It almost worked, causing casualties and a retreat but the British Regular infantry unit survived the Retreats and hits with one block, forcing the dragoons back. 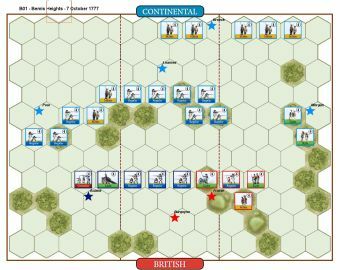 The British full-strength Light Infantry accompanied by General Webster turned their muskets on the dragoons and blew them away in successive volleys. 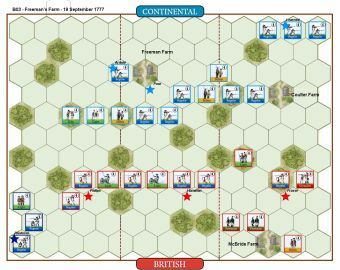 The British Left charged in with first Provincial Infantry and then followed it up with Highlanders and Tarleton's Dragoons, led by Tarleton himself. It all met with a mixed response with the Provincials only just surviving with a block eah but causing some damage and then a Left Flank card enabled the Provincials to be moved into support positions and the Highlanders and Dragoons crash through. Despite some brave Marylanders being wiped out by the Highlanders' successive attacks the Dragoons also reduced the second Marylander infantry to one block but just couldn't finish them off or, as often happens with one-block unit, it passed every rout test! The Americans managed to finish off both Provincial and the Highlanders but Tarleton's Dragoons took the sensible option and retreated to rally with the aid of bonus rally dice. 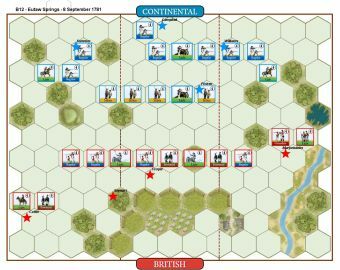 The British left now looked thinned out and was holding with only the North Carolina Tory Militia Unit, damaged dragoons, a roadside Regular Infantry unit and two generals. However, the British Right had been active and had swept into the central woods clearing it of Militia and winning the game. 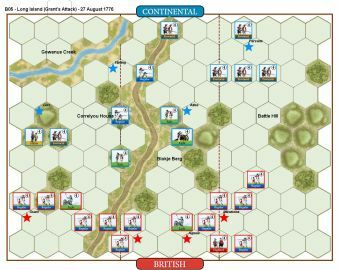 Even at long range a Line Volley gave each of the full-strength British units 3 dice shooting into the woods and the Militia and now supporting Regulars were taking hits and, worse for them, multiple retreats, which non-Light infantry cannot ignore. Concentration of fire from 5 units cleared 2 American units from the woods in rout and it was a full-scale American retreat, with at least the Marylander and Delaware Regular Infantry coming out with considerable credit and reputations enhanced. The Americans are in a bad position to start with and have to make the most of their Artillery and even pulling back their left before it becomes overwhelmed. If the first British move is a Line Volley it is very deadly for the American left. For the British it's a matter of being patient whilst their right wing dismantles the American left. The British right wing just has to soak up the American artillery fire. Constant pressure on the American left should minimise this. Two thumping wins for the British. First up a 10-2 victory with the British opening cannonade causing casualties then a Line Volley causing further heavy damage on the American centre and especially the vulnerable left wing. The British follow this up with a Line Command and then another Line Volley and the American left was simply blown away with militia and supporting artillery all destroyed or routed. The British Line Advance brought their own Provincials within American musket range the Marylanders with artillery support did some real damage. 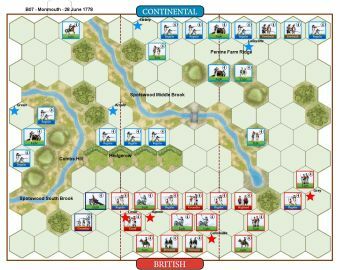 Both Provincial units tried a bayonet charge but were destroyed, but too little too late and the American line collapsed totally with Cornwallis leading some Regulars straight through the centre to clear the road. The scenario well plays Gates' disastrous decision to not support his Militia infantry and then advance them.